One of my favourite activities with Stampin' Up! is swapping cards with other demonstrators. Not only do you get to make new friends but you get to take home some of their great designs. This is a card I got at convention from Gloria Penwell of Windsor Junction, Canada. I loved the design of this card and the colours. I think it is absolutely gorgeous. Tonight I am participating in another swap and I needed to make a card using the Just Believe stamp set from the Stampin' Up! Idea Book and Catalogue and I needed to use a technique. This is the card I made that was inspired by Gloria's card. These are the steps I took to make my card. 1. Looked at the stamp set Just Believe (required to use for swap) and my swap cards and chose a card (Gloria's) based on the stamps. 2. I used Gloria's card as a sketch so that I could create my card. Next, I chose"black magic" as a technique that I would use in my card. 3. 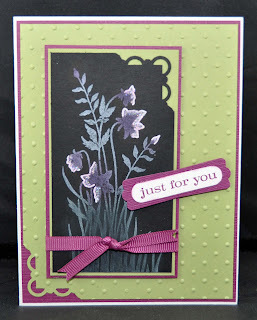 I stamped the image from the Just Believe stamp set with Whisper White craft ink on basic black card stock. 4. Began selecting the colours I would use. I actually was going to use baja breeze but then chose tempting turquoise and then ended with Rich Razzleberry and Pear Pizzazz. I am a visual person so I usually just play with each colour of cardstock until I am happy with the look and sometimes it just comes down to what colour of coordinating ribbon I have in stock. 7. 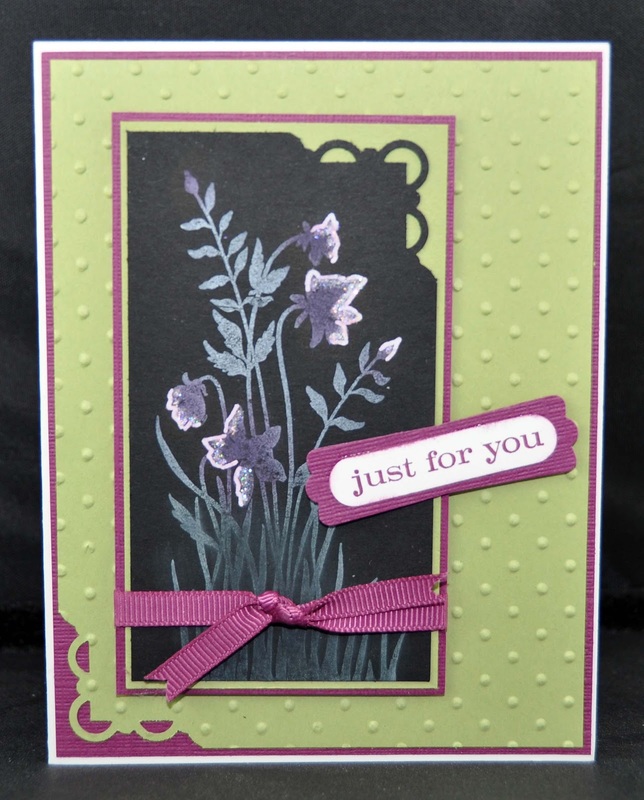 Stamp sentiment from "Just Believe" stamp set in Rich Razzleberry and punch out with word window punch. 8. Use Sponge daubers and Rich Razzleberry and Pear Pizzazz ink to colour the white image. 9. 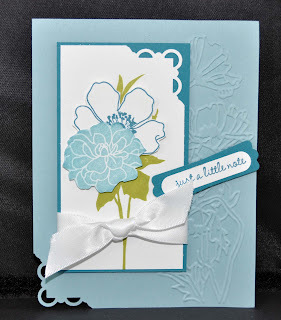 Outline with Stampin' Up! White gel pen. 10. Use a two way glue pen and add dazzling diamonds glitter. 11. 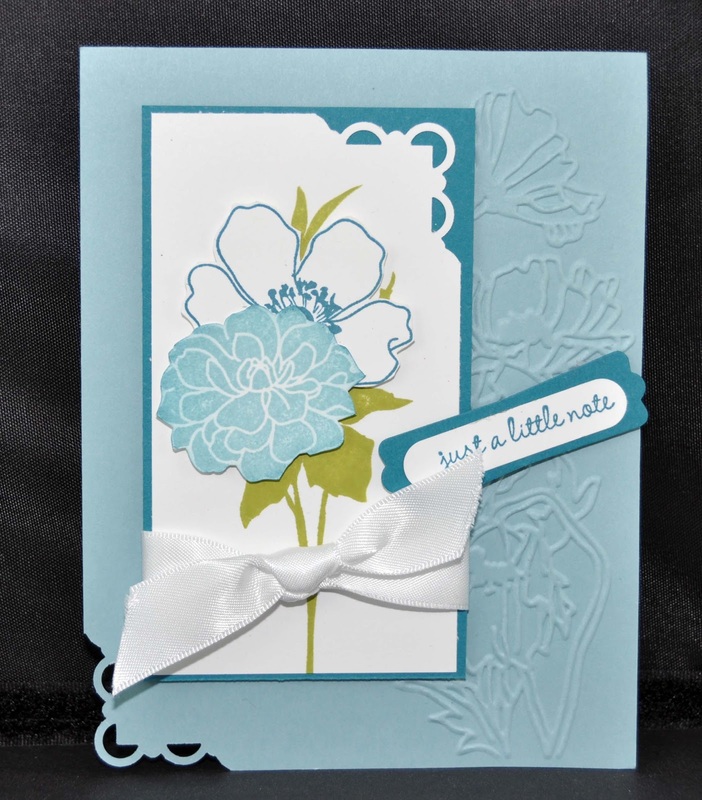 Use the scallop border corner punch to punch out the top right corner of the black piece and the large pear pizzazz piece of cardstock. 12. Use the Perfect Polka Dots embossing folder and run the largest pear pizzazz piece through the Big Shot. 14. Use rich razzleberry 1/4 inch grosgrain ribbon to wrap around image and tie in a knot. 15. Use dimensionals to pop up the image. 16. Add sentiment with dimensionals. Voila! A similar card and yet very different. I made 12 of these cards and I'm off to swap them now. Can't wait for the swap tonight and to see this beauty in person! Love black magic technique and almost did it on mine! Love this card even more in person, Denise! Congrats on the new blog format...you are going to love it!